As this is officially Obsessed With Hardware Week, things way way way on the bottom of the endless To Do list at the Cross House have been pulled up to page one. And on page one are skeletons!!!!!! In the butler’s pantry were a bunch of keys hanging, many of them classic skeleton keys. 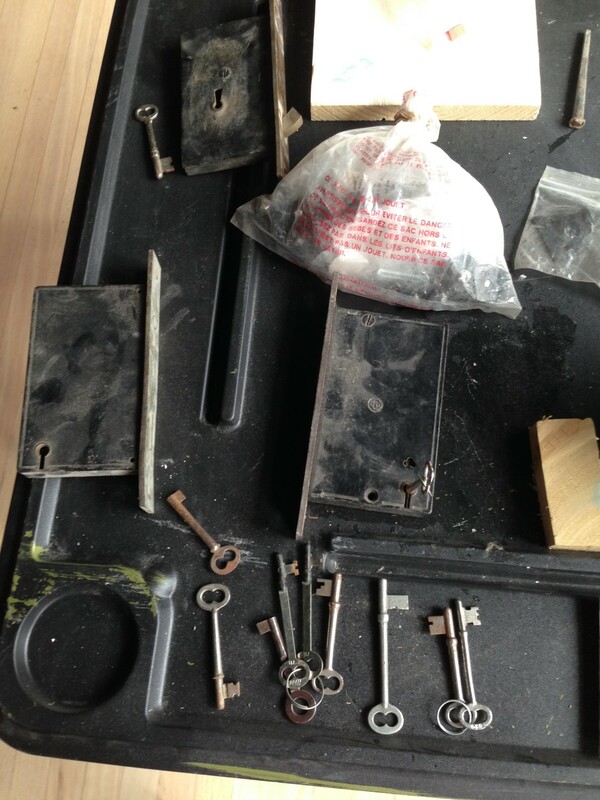 In the past, I half-heartedly tried to find which keys fit what locks, but to no avail. This week however, Brian was at the house, and he seemed interested in all things hardware. Brian is very young and loves old houses. This just warms my old heart, and I delight in knowing that at least one young person is interested in taking up the cause of old houses when I am long buried. I have been worried that young people all want sensible houses. At least this what my real estate agent tells me. And I never argue with Lacie. So, Brain and I went to the basement and hauled up the hardware boxes, grabbed all the keys from the butler’s pantry, placed these treasures on a plastic card table, and went at it. Key after key after key did not fit anything. Then Brian whoopped! I looked up, and he grinned wide as one key open/closed a lock! This energized us, and we ran all over the house fitting keys into locks, Brian in one room and me in another. There were lot’s of drats but then the occasional whoop reverberated through the huge empty house. It is a big house with more doors than there are numbers in the federal debt but we finally found the right fit for about 3/4 of the keys. This begs a question: WHAT do the other keys fit? Yes, it is all kinda silly. I mean, these are just keys and locks. Yet each match produced a whoop and a tingle of satisfaction rippling down a spine. Sweet. With each match Brain and I repeatedly open/closed the lock, a big smile of delight and satisfaction across our respective young and old faces. Brian and I felt victorious. We were key GODS! Locksets and keys. Locksets and keys. 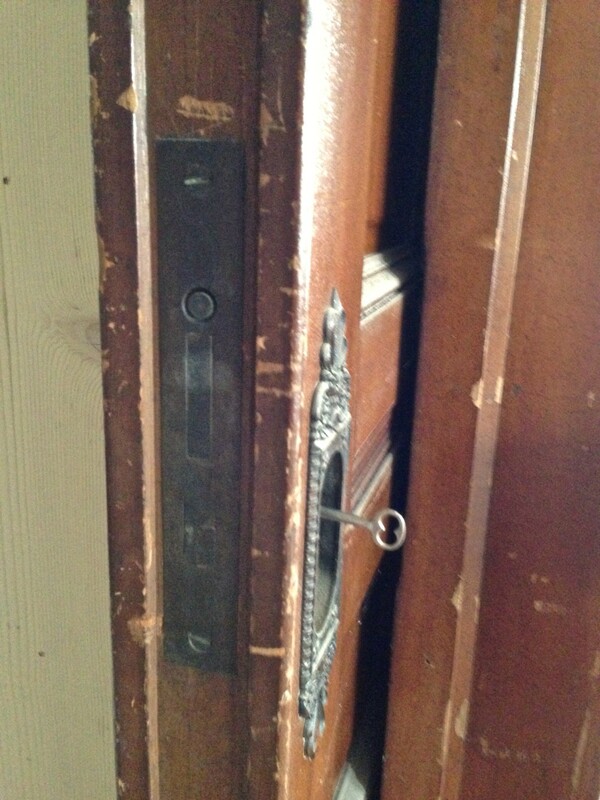 A lockset in one of the pocket doors. The key fitted! Whoop! …magic! A finger pull pops out! This allows one to pull the door closed when it is otherwise fully tucked into the wall. And guess what happens when you turn the key? Zounds! More magic! The lock mates with the female version in the opposing door. In the key stash was this curious pair. Huh? Does anybody know what these fit? Gas valves? Radiator valves? A portal to another dimension? I’d ask your radiator guys the next time they visit you. They look like something related to radiators to me — but I’m definitely no expert. I’ll be interested to see what you find out from the folks who are. Those little keys in the last picture usually bleed the radiators. You have to do that once in awhile to release the air that builds up, or else you get those knocking sounds. Oh Ross, never stop blogging about the Cross House! I vote for radiator keys. We have a hot water system, and I always need to let the air out of the radiator tops every autumn. 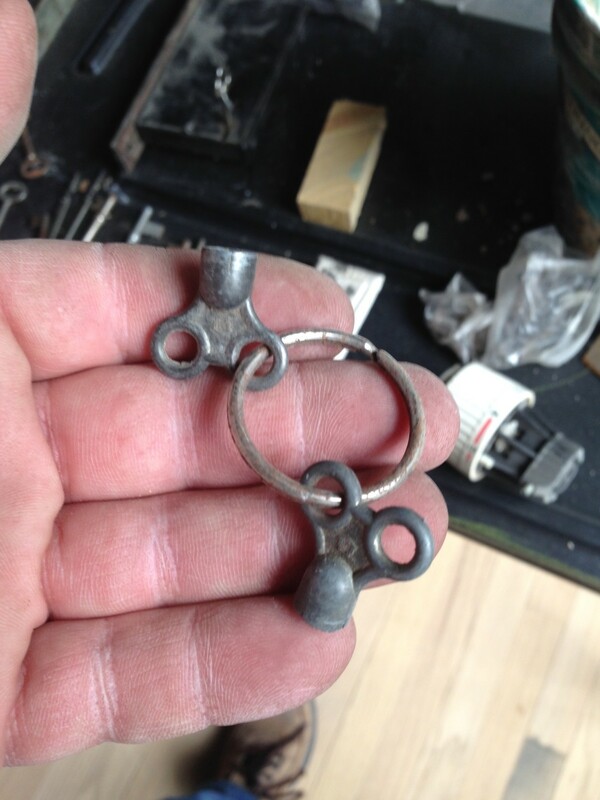 Yep, I agree they look like radiator keys. My vote is for radiator bleed keys. Worked in an old store one time that had gas lighting in the front show windows, and you needed a key like that to turn the gas off and on. First, I agree whole-heartedly with Tiffaney, please never stop blogging about this journey. Regarding the keys, I was going with the portal to another dimension, or at least another time!! Following your adventures is like time travel and it’s so much fun! Now to label all the keys and organize them, maybe with hooks in the butler’s pantry for the different rooms? Groan. But worse groan is having to figure it out all over again. I’m enjoying your adventures. I have no keys for all the old locks in my house, the room doors and closets and the stairs to the second floor. I did have a locksmith rekey the front door. I never use it but occasionally someone turns the knob on the inside and locks it as they leave the house, so it’s good to be able to get back in. Ross, I believe they must be radiator valve keys. Now you need some swanky tassels for those keys that have found their respective locks! Everyone has already noted they’re likely radiator keys, but if they happen to be too large for that they’re gas keys for your fireplaces – ours have a decorative valve just outside the tiled hearth. What fun you must be having, your hardware is stunning, thanks for finally sharing it! 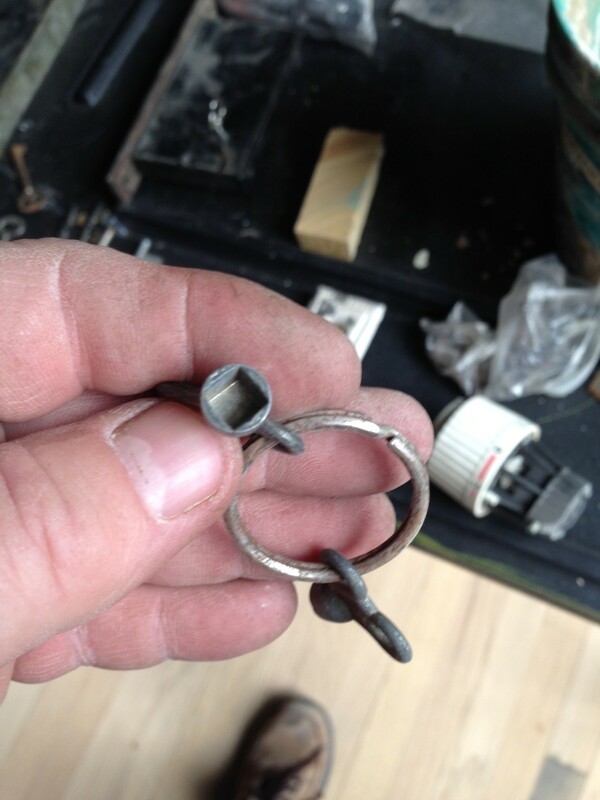 We had a similar hunt the day I found our ring of keys in the basement – sadly all our hardware is firmly painted shut at the moment!!! I agree with Tiffany and Carla. Love your stories and all the exotic details. Would you mind looking at the deed record and tell me if Frank Toms is a past owner and for what years? An owner timeline is here. Thanks Ross. It appears Frankie Toms owned the house longer than anyone else. He was my maternal grandfather’s cousin. When I was a kid I fantasized about one day inheriting the house! Of course I thought of it as the Toms house instead of the Cross house. You’re entwined in both sides of my family through our houses. Your house in Strong City was my paternal Grandma’s. I’m so glad you have done so much to save both houses. Any luck with the front screen doors, Ross? Oh, it has all been quite tantalizing! I was told to meet the owner of the doors at his storage building. I was tingling with excitement all day. Then the owner called; he did not have the right key. Meeting rescheduled for next day. Next day: entered storage building…but no doors. Owner now thinks doors might be in another location of his. He said he will see if the doors are there. He is pretty sure he has them. The funny little key is for the radiator valves…ever year we have to “bleed” the air out of our system and add water for it to operate efficiently. My house isn’t nearly as old but steam heat still works that way…from what I know. I have enjoyed your key search and now to see if my pocket doors have buttons that push! I don’t know how you controlled yourself this long. I would have been trying to match the keys the SECOND I found them. This is so cool!! 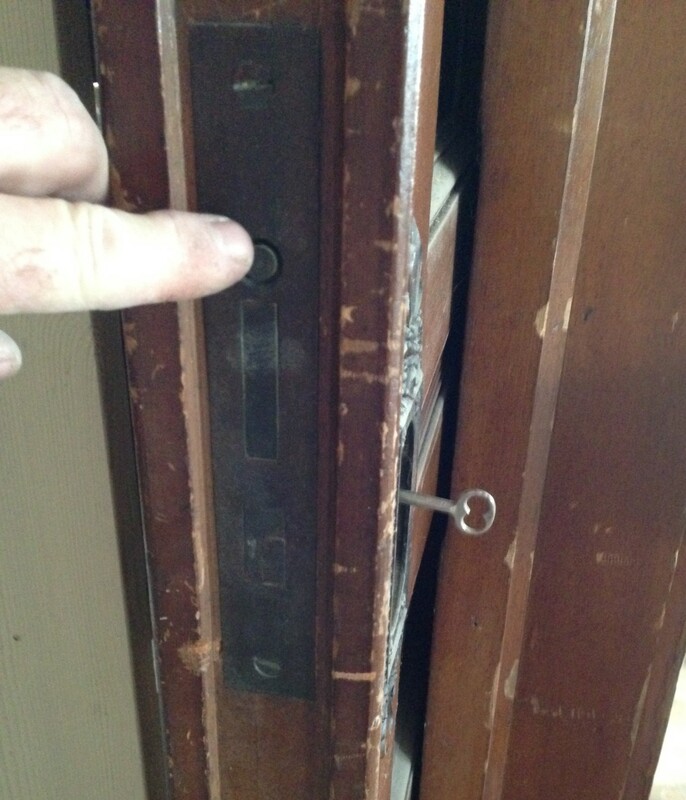 As you can tell from the photos of the pocket doors with keys in them, they have one big problem – they will not retract into the wall with the key in the lock. 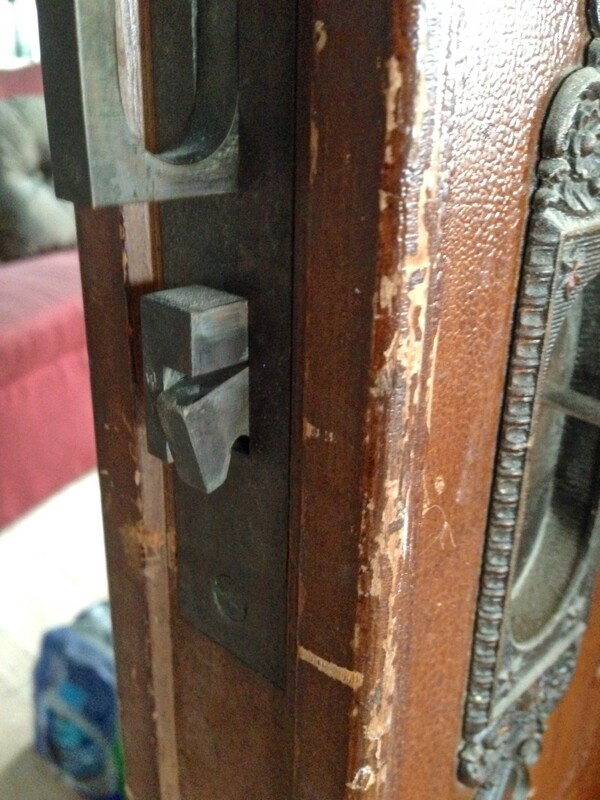 This is because pocket door locks used a very special and very different type of key, unique to them. These keys were stubby with a recessed or folding thumbturn that allowed them to remain in the lock constantly yet sit flush within the recess of the pocket door pull. While still operating on the ward-and-bit system, they were typically solid bronze, often had decorative turnpieces, and some could even be adjusted to fit the depth of the door thickness. For a nice little collection of pocket door keys. 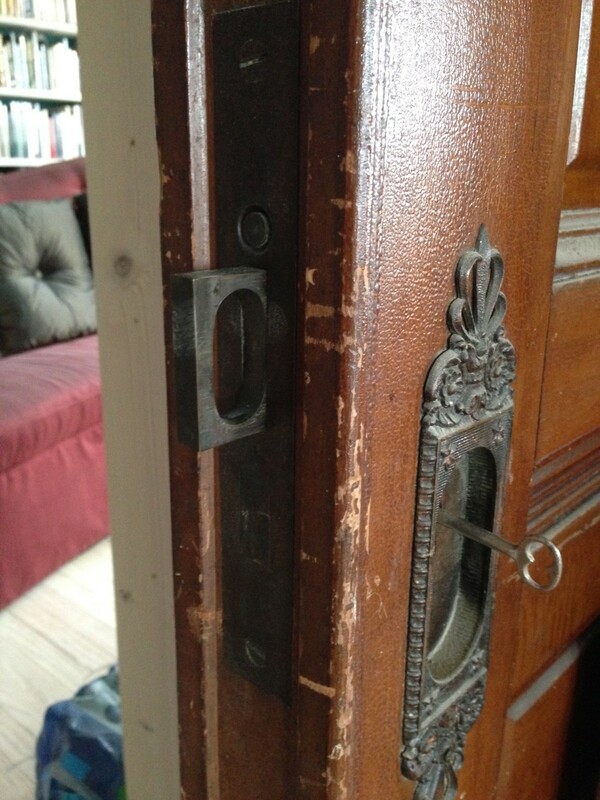 You can see a key in situ in the photo of the pair of doors featured about a quarter-way down the page here. So Ross, is your house in Strong City (Sally grandma’s house) an ~ordinary~ house? It’s the BARN I love at the Z-Bar. Three-story – be still my heart! OMGosh, yes! When it was built it missed being the largest barn in Kansas by two feet I think. They could drive in one door, unload, then drive out the other. The pine beams were brought by rail from Colorado. Sigh, I sure miss Kansas sometimes! Last time I was there I filled the trunk of the car with limestone rocks so I could build a mini house in my garden up here. Maybe your keys fit some of my doors. I seem to only have two keys currently.